The USC Trojans football program, established in 1888, represents the University of Southern California in college football. USC is a member of the National Collegiate Athletic Association (NCAA) Division I FBS and the Pac-12 Conference (Pac-12). The Trojans throughout NCAA history have claimed 11 national championships. As of 2016, 497 Trojans have been taken in the National Football League draft, more than from any other university; the Trojans also have had more players drafted in the first round than any other university, with 79 as of the 2016 draft. USC has the most Pro Football Hall of Famers (12). USC has the highest all-time post-season winning percentage of schools with 25 or more bowl appearances. The team is coached by Clay Helton. USC first fielded a football team in 1888. Playing its first game on November 14 of that year against the Alliance Athletic Club, USC gained a 16–0 victory. Frank Suffel and Henry H. Goddard were playing coaches for the first team which was put together by quarterback Arthur Carroll; who in turn volunteered to make the pants for the team and later became a tailor. USC faced its first collegiate opponent the following year in fall 1889, playing St. Vincent’s College to a 40–0 victory. USC achieved intermittent success in the years following Jones' tenure. Jeff Cravath, who coached from 1942–1950, won the Rose Bowl in 1943 and 1945. Jess Hill, who coached from 1951 to 1956, won the Rose Bowl in 1953. From 1957 to 1959, the Trojans were coached by Don Clark. The program entered a new golden age upon the arrival of head coach John McKay (1960–1975). 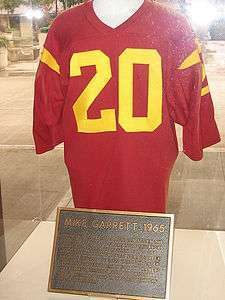 During this period the Trojans produced two Heisman Trophy winners (Mike Garrett and O.J. Simpson) and won four national championships (1962, 1967, 1972 and 1974). McKay's influence continued even after he departed for the NFL when an assistant coach, John Robinson (1976–1982), took over as head coach. Under Robinson, USC won another national championship in 1978 (shared with Alabama; ironically, USC defeated Alabama, 24–14, that same season) and two more players won the Heisman Trophy (Charles White and Marcus Allen). On September 12, 1970, USC opened the season visiting the University of Alabama under legendary coach Paul "Bear" Bryant and became the first fully integrated team to play in the state of Alabama. The game, scheduled by Bryant, resulted in a dominating 42-21 win by the Trojans. More importantly, all six touchdowns scored by USC team were by black players, two by USC running back Sam "Bam" Cunningham, against an all-white Crimson Tide team. After the game, Bryant was able to persuade the university to allow black players to play, hastening the racial integration of football at Alabama and in the Deep South. It was during this time that the Trojans were unable to defeat their rivals. They suffered winless streaks of 13 years (1983–1995, including the 1994 17–17 tie) to rival Notre Dame and 8 years (1991–1998) to crosstown rival UCLA which were unacceptable to many USC supporters. Under Robinson the Trojans were 2-2-1 against Notre Dame, but unable to beat UCLA. After posting a 6-6 record in 1996, and a 6-5 record in 1997, Robinson was fired. In 1998, head coach Paul Hackett took over the team, but posted an even more disappointing 19–18 record in three seasons than any of his recent predecessors. By 2000, some observers surmised that USC football's days of national dominance were fading; the football team's record of 37–35 from 1996 to 2001 was their second-worst over any five-year span in history (only the mark of 29–29–2 from 1956–1961 was worse), and the period marked the first and only time USC had been out of the final top 20 teams for four straight years. In 2003, highly touted but unproven redshirt sophomore Matt Leinart took over for Palmer at quarterback. Although his first pass went for a touchdown in a win over Auburn, the Trojans suffered an early season triple-overtime loss to conference rival California in Berkeley. Nevertheless, Carroll guided the team to wins in their remaining games and they completed the regular season 11–1. Before the postseason, both the coaches' poll and the AP Poll ranked USC number #1, but the BCS—which also gave consideration to computer rankings—ranked Oklahoma first, another one-loss team but one that had lost its own Big 12 Conference title game 35–7, with USC ranked third. In the 2003 BCS National Championship Game, the Sugar Bowl, BCS #2 LSU defeated BCS #1 Oklahoma 21–14. Meanwhile, BCS #3 USC defeated BCS #4 Michigan 28–14 in the Rose Bowl. USC finished the season ranked #1 in the AP poll and was awarded the AP National Championship; LSU, however, won the BCS National Championship title for that year, prompting a split national title between LSU and USC. In the wake of the controversy, corporate sponsors emerged who were willing to organize an LSU-USC game to settle the matter; nevertheless, the NCAA refused to permit the matchup. In June 2010, after a four-year investigation, the NCAA imposed sanctions against the Trojan football program for a "lack of institutional control," including a public reprimand and censure, a two-year postseason ban, a loss of 30 scholarships over three years, and vacation of all wins in which Reggie Bush participated as an ineligible player, including the 2005 Orange Bowl, in which the Trojans won the BCS National Championship. These sanctions have been criticized by some NCAA football writers, including ESPN’s Ted Miller, who wrote, “It's become an accepted fact among informed college football observers that the NCAA sanctions against USC were a travesty of justice, and the NCAA’s refusal to revisit that travesty are a massive act of cowardice on the part of the organization." 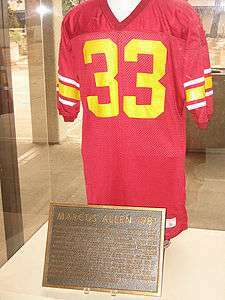 On May 26, 2011, the NCAA upheld all findings and penalties against USC in their infractions case on former players Reggie Bush and basketball player O.J. Mayo. The USC football team did not participate in the Pac-12 Football Championship Game or a bowl game during the 2011–12 season. The BCS announced June 6, 2011, that it had stripped USC of the 2004 title, but the Associated Press still recognizes USC as the 2004 AP National Champion. The 2006 Trojans came out strong, easily defending their top 10 status throughout the year. As the season progressed, USC began to display marked inconsistencies, as their margins of victory began to slip. The first setback proved to be a 31–33 loss to unranked Oregon State, in which the Beavers were able to repeatedly capitalize on several Trojan turnovers. Even though USC dropped initially in the polls, they worked their way back up. After defeating both Cal and Notre Dame, they held the number 2 spot heading into the final week of the season. The Trojans were considered to be a virtual lock for the National Championship Game against Ohio State and just needed to beat UCLA. USC was shocked in the final game of the season, losing to crosstown rival UCLA 13–9. This eliminated the Trojans from championship contention and opened the door for Florida to become Ohio State's opponent. The Trojans did earn a Rose Bowl bid and defeated Michigan 32-18. It was the Trojans fifth straight BCS Bowl appearance. After beating Boston College in the Emerald Bowl, USC finished the season 9–4, and ranked #20 in the Coaches' Poll and #22 in the AP Poll. USC ended its seven-year streak of Pac-10 Championship, BCS bowl appearance and top 4 finish of the AP Poll. The Trojans started the season strong beating #8 Ohio State at The Horseshoe. But they would lose to four Pac-10 teams (Washington, Oregon, Stanford, and Arizona). Blowout losses to Oregon 47-20 and Stanford 55-21 marked a turning point in USC's season and sparked debate in the media about the future dominance of USC football. After the season concluded, head coach Pete Carroll resigned to accept a head coaching position with the Seattle Seahawks. In 2009, USC was named “Team of the Decade" by both CBSSports.com and Football.com, as well as the “Program of the Decade" by SI.com, plus was No. 1 in CollegeFootballNews.com’s “5-Year Program Rankings" and was ranked No. 2 in ESPN.com’s “Prestige Rankings" among all schools since 1936 (behind Oklahoma). In June 2010, after a prolonged four-year investigation into whether former USC running back Reggie Bush and his family had accepted financial benefits and housing from two sports agents in San Diego while he was a student athlete at USC, the NCAA imposed sanctions against the Trojan football program for a "lack of institutional control," including a two-year postseason ban, the loss of 30 scholarships over three years, and the vacation of all wins in which Bush participated as an "ineligible" player, including the 2005 Orange Bowl, in which the Trojans won the BCS National Championship. These sanctions have been criticized by some NCAA football writers, including ESPN’s Ted Miller, who wrote, “It's become an accepted fact among informed college football observers that the NCAA sanctions against USC were a travesty of justice, and the NCAA’s refusal to revisit that travesty are a massive act of cowardice on the part of the organization." The 2010 team finished 8-5 (5-4 in the Pac-10) and was ineligible for post-season play. In 2011, although USC finished in first place in its conference division with a 7-2 record, due to their ineligibility to participate in a bowl game, the UCLA Bruins became champions of the inaugural Pac-12 South Division. In the final regular season game, USC's 50-0 win over UCLA was the largest margin of victory in the rivalry since 1930. The release of the December 4, 2011 final regular season Associated Press college football poll marked USC's return to national prominence with the #5 ranking. The Trojans were not eligible for post season play and did not participate in any Bowl game. When the final AP Football Poll was release USC dropped one spot to the #6 ranking. USC was ranked number one in The Associated Press’ preseason college football poll for the seventh time in school history and the first time in five seasons, edging out No. 2 Alabama and No. 3 LSU. However, the early season expectations would backfire as the Trojans would eventually finish 7-5 (5-4 versus Pac-12 opponents), including losses to both UCLA and Notre Dame. The team finished second in the Pac-12 South standings and unranked in any poll. The 2015 season was a tumultuous one for the Trojans with a season record of 8–4 overall and 6–3 in Pac-12 play to finish as Pac-12 Southern Conference champions. Mid-season, coach Steve Sarkisian was fired to deal with personal issues and Clay Helton was again named the interim head coach (he was also interim head coach for the 2013 Las Vegas Bowl after Orgeron left the school following Athletic Director Pat Haden's decision to hire Sarkisian over Orgeron as the new head coach beginning in 2014). The Trojans had lost to Stanford and Washington under Sarkisian. Under Helton, USC lost to Notre Dame, but then rallied to win the next four games. A loss to Oregon left the South Division conference championship to be decided by the USC-UCLA game; USC won 40-21. USC played in its first ever Pac-12 Conference championship game, losing to Stanford (41-22) after the Cardinal (8-1 in Pac-12, 9-2 overall) locked up the North Division title, its third in four years, with its victory over California. USC went on to lose the 2015 Holiday Bowl 23–21 to the Wisconsin Badgers. On December 7, Sarkisian filed a $30 million termination lawsuit against USC. * In 11 cases, one of the games involved in these perfect days was not played on a Saturday. In these cases, the perfect day is counted if the games occurred in the same week. 1995–1998, 2002, 2005–2006, or 2012–2013. 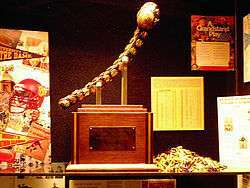 USC plays the University of Notre Dame each year for the Jeweled Shillelagh. The intersectional game has featured more national championship teams, Heisman trophy winners, All-Americans, and future NFL hall-of-famers than any other collegiate match-up. The two schools have kept the annual game on their schedules since 1926 (except 1943–45 because of World War II travel restrictions) although it enjoys neither the possibility of acquiring regional "bragging rights" nor the import of intra-league play that drive most rivalries. Notre Dame leads the series 46–37–5. The game is often referred to as the greatest intersectional rivalry in college football. USC's rivalry with UCLA is unusual in that they are one of a few pairs of Division I FBS programs that share a major city. Both are located within the Los Angeles city limits, approximately 10 miles (16 km) apart. Until 1982, the two schools also shared the same stadium: the Los Angeles Memorial Coliseum. 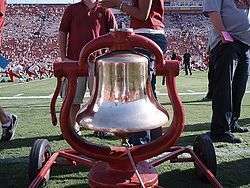 The crosstown rivals play each year for city bragging rights and the Victory Bell; and often for the right to go to the Rose Bowl. The UCLA rivalry tends to draw the focus of student supporters since many USC students have friends or family members attending "that other school" (of course, many UCLA students refer to their USC friends in the same manner) and many Southern California families are divided between Trojan Cardinal and Bruin Blue. USC leads the all-time series 47–31–7 including their victory in 2015. Stanford's recent success against USC has continued under Harbaugh's successor David Shaw, who defeated Kiffin in their two meetings (2011 and 2012. Of note is that USC's 2014 win, which occurred at Stanford Stadium, snapped the Cardinal's 17-game home win streak, which had dated back to 2011. All told, Stanford has defeated USC in 8 of the last 11 meetings, winning in 2007, 2009, 2010, 2011, 2012, twice in 2015 (including the Pac-12 Championship, in which Stanford defeated the Trojans 41-22 prior to moving on to win the Rose Bowl and a #3 national ranking), and in 2016. "Tailback U" is a nickname that emerged during the regime of Hall of Fame college football coach John McKay ('60–'75) and continued by his former offensive coordinator and immediate successor, John Robinson ('76–'82). Running plays of this era included Coach McKay's well-known "Student Body Right" play, which emphasized hard-nosed running in the pass-friendly Pacific-10 Conference. 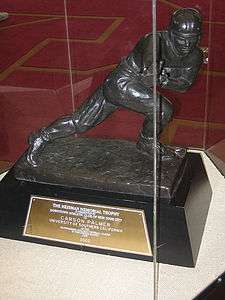 McKay and Robinson produced a number of top-rated players at the tailback position, including four Heisman Trophy winners. Standouts included Mike Garrett, O. J. Simpson, Anthony Davis, Ricky Bell, Sam Cunningham, Charles White, and Marcus Allen. Coach Pete Carroll ('01–'09) continued the trend in later years with Reggie Bush, LenDale White and Justin Fargas. A recent tradition has a selected linebacker wearing the number 55. The number cannot be taken but is assigned by the head coach. Pete Carroll had, at times, refrained from assigning the number if he did not think any player was worthy of it. The linebacker wearing No. 55 is typically regarded as the anchor of the defense. Notable players who have worn No. 55 for USC include Junior Seau, Willie McGinest, Markus Steele, Chris Claiborne, and Keith Rivers; Seau, McGinest, Claiborne and Rivers were all top-10 picks in the NFL Draft. Senior Lamar Dawson is the most recent No. 55. The last non-linebacker to wear No. 55 was offensive center John Katnik in 1989. A phrase commonly used by Trojan fans to greet one another or show support for the team, which is borrowed from the fight song of the same name (i.e., "Fight On for ol' S.C./Our men Fight On to Victory..." The two finger "V" salute for Victory is often given in accompaniment. The term came from a LA Times article in regard to a USC vs. Stanford track meet. Though USC lost by a considerable amount, LA Times writer Owen Bird wrote that USC "Fought on like Trojans". Shortly after changing USC's team name from the "Fighting Methodists" to the "Trojans" in 1912, "Fight On" was taken as its slogan amongst fans. Since the establishment of the team in 1888, USC has appeared in 52 bowl games. The Trojans appeared in 33 Rose Bowls, winning 24, both records for the bowl. These are also the most times a team has appeared in or won any bowl game. Prior to the construction of the Los Angeles Memorial Coliseum, the Trojans divided their games between a number of facilities. Prior to 1893, the Trojans played football in a vacant lot on Jefferson Boulevard before the lot was developed as residences. In the 1890s, USC's primary home field was Athletic Park. Several games in the 1890s and all games in 1916 were played in Fiesta Park in Downtown Los Angeles. The 1900 home stand was played at Chutes Park, a facility located within a Los Angeles pleasure park shared with the Los Angeles Angels baseball team, while the 1903 season was played at nearby Prager Park and three games in the 1910s were played at Washington Park, the successor to Chutes Park. From 1904 to 1910, 1914-15, and 1917-22, most of USC's home games were played at the on-campus Bovard Field. USC also played home games in Pasadena, at Sportsman's Park, Tournament Park and the Rose Bowl. The Los Angeles Memorial Coliseum is one of the largest stadiums in the United States. 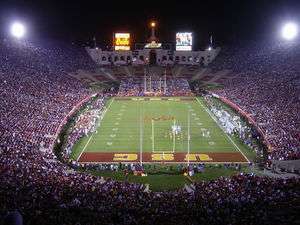 USC has played football in the Coliseum ever since the grand stadium was built in 1923. In fact, the Trojans played in the first varsity football game ever held there (beating Pomona College 23–7 on October 6, 1923). The Coliseum was the site of the 1932 Summer Olympics and hosted the opening and closing ceremonies and track events of the 1984 Olympic Games. Over the years, the Coliseum has been home to many sports teams besides the Trojans, including UCLA football, the NFL's Los Angeles Rams and Raiders, the Los Angeles Chargers in 1960 of the AFL, and Los Angeles Dodgers baseball, including the 1959 World Series. The Coliseum has hosted various other events, from concerts and speeches to track meets and motorcycle races. The Coliseum has a present full-capacity of 92,000 seats (almost all are chair-back seats). The Coliseum is located on 17 acres (69,000 m2) in Exposition Park, which also houses museums, gardens and the future Banc of California Stadium. It has also earned the nickname, "The Grand Old Lady". 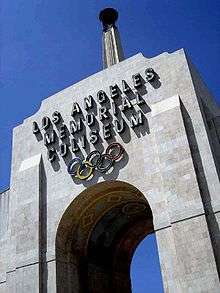 Both the Coliseum is managed and operated by USC under a master lease agreement with the LA Memorial Coliseum Commission, as was the Los Angeles Memorial Sports Arena for a number of years prior to its 2016 demolition. The USC football team practices on campus at Howard Jones Field, which was expanded in the fall of 1998 to include Brian Kennedy Field. In early 1999, Goux's Gate, named for the popular long-time assistant coach Marv Goux, was erected at the entrance to the practice field. Opened in 2012, the $70 Million, 110,000-square-foot athletic and academic center named after legendary football coach John McKay is home to the USC Trojan Football Department. The building houses meeting rooms, coaches’ offices and a locker room for the football program, as well as the Stevens Academic Center (including space for tutoring, counseling, study and computer rooms for student-athletes), a weight room, an athletic training room and a state-of-the-art digital media production facility for all of USC’s 21 sports. USC claims 11 national titles, including 7 from the wire service AP Poll and/or Coaches' Poll. Two of USC's championships, 1928 and 1939, are based on the Dickinson System, a formula devised by a University of Illinois professor that awarded national championships between 1926 and 1940. The Dickinson System is cited in the Official 2010 NCAA FBS Record Book as a legitimate national title selector. 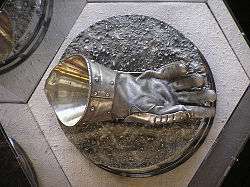 USC's claim is consistent with other FBS programs that won the Dickinson title. In 2004, USC recognized the 1939 squad as one of their national championship teams. The 2004 team was forced to vacate the final two games of its season, including the 2005 Orange Bowl due to NCAA sanctions incurred as a result of loss of institutional control, and namely, in connection with Reggie Bush. USC appealed the sanctions, delaying consideration of vacating USC's 2004 championship by the BCS. Ultimately, USC lost the appeals and forfeited the 2004 BCS championship. The AP has stated that it will not vacate its 2004 championship awarded to USC, and hence the Trojans retain a share of the national title. The Trojans have suffered only three losing seasons since 1961 and have captured 38 PCC/Pac-10/Pac-12 titles including 7 seven consecutive Pac-10 titles from 2002-2008 (2004 and 2005 Pac-10 titles were later vacated due to NCAA sanctions). This gives them the 4th most conference championships of any NCAA school, and twice as many as any other Pac-12 member team. The Trojans have played in 49 bowl games, a total that trails Alabama's 58 bowl appearances, and Texas's 50 bowl appearances. USC has the highest winning percentage in bowl games (.653) among teams with at least 15 bowl appearances. Finally, USC's 32 Rose Bowl appearances and 24 victories are the most of any school in a single bowl. 1 Although the number is not officially retired, the Trojans have not reissued it. USC has had more players (493), and more first round NFL Draft picks (77) than any other college. 162 Trojans have been selected to the NFL Pro Bowl, while a Trojan has played in all but two Super Bowls. ↑ "Colors for Screen". USC Identity Guidelines. University of Southern California. Retrieved 2016-01-19. ↑ Traditions: USC National Titles, USCTrojans.com, accessed March 22, 2008. 1 2 "Colleges with Most Draft Picks". Drafthistory.com. Retrieved May 2, 2016. ↑ "Top 10 schools with the most Pro Football Hall of Famers". www.nfl.com. Retrieved April 21, 2016. 1 2 3 Mal Florence et al., The Trojan Heritage, 2004 USC Football Media Guide, USC Athletic Department, pp. 201-209. 1 2 Yaeger, Don; Sam Cunningham; John Papadakis (September 1, 2006). Turning of the Tide: How One Game Changed the South. Center Street. ISBN 1-931722-94-3. 1 2 USC Sports Information Office (July 26, 2011) "2011 USC Trojans Football Notes." 1 2 "NCAA sanctions against USC". The Los Angeles Times. June 10, 2010. 1 2 Bryant Gumbel, "Student/Athlete Behavior", Real Sports with Bryant Gumbel, September 21, 2010. 1 2 Jay Bilas, "Anyone know what NCAA's standards are? ", ESPN.com, July 1, 2010. 1 2 Bryan Fischer, " Trojans never stood a chance after taking NCAA's best shot", CBSSports.com, May 26, 2011. 1 2 Pete Fiutak, "USC paying for NCAA's inconsistency? ", FoxSports.com, May 26, 2011. 1 2 Stewart Mandel, "What USC's sanctions mean for Ohio State", SportsIllustrated.com, April 27, 2011. 1 2 Miller, Ted. "What we learned in the Pac-12: Week 14". Pac-12 Blog. ESPN.com. 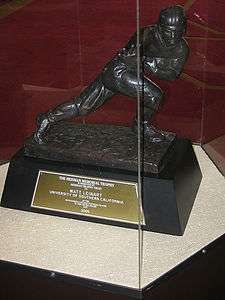 ↑ Mike Hiserman, "USC to send back its Reggie Bush Heisman", Los Angeles Times, July 20, 2010. 1 2 "Reggie Bush to forfeit Heisman". ESPN.com. September 15, 2010. Retrieved September 15, 2010. ↑ "Report: Reggie Bush to be stripped of 2005 Heisman Trophy". ESPN Los Angeles. ↑ "Sharps, oddsmaker favor USC over Texas". October 26, 2005. ↑ Whiteside, Kelly (January 5, 2006). "Texas takes down USC". USA Today. Retrieved May 27, 2010. ↑ Three and out: Beavers stun USC; BCS race wide open, Associated Press, October 28, 2006, Accessed October 15, 2008. ↑ Ivan Maisel, Carroll's coaching propels USC to top of decade ranking, ESPN.com, July 27, 2007. ↑ Storied programs dominate Ladder 119's top rungs, ESPN.com, July 27, 2007. ↑ Stewart Mandel, Early look at '07, CNNSI.com, January 16, 2007. ↑ Mark Schlabach, Trojans, Wolverines top revised look at 2007, ESPN.com, January 22, 2007. ↑ Christine Daniels, They're No. 1 on this list too, Los Angeles Times, September 28, 2007. ↑ Chris Dufresne, UCLA victory is crucial for Dorrell, Los Angeles Times, September 20, 2007. ↑ "Kiffin bolts Tennessee to coach USC". Retrieved January 13, 2010. ↑ "Pac-10 commish: Now is the time to consider expansion". CBS Sports. February 9, 2010. Retrieved February 10, 2010. ↑ "2011 Pac-12 Football Championship Game". ↑ "Top 25 College Football Poll". Associated Press. ↑ "USC No. 1 In AP Top 25 Rankings, Alabama No. 2 And LSU No. 3". CBS News New York. Retrieved August 18, 2012. ↑ "No. 17 UCLA knocks off No. 21 USC 38-28". November 17, 2012. ↑ Dilbeck, Steve (November 24, 2012). "Notre Dame finishes off USC to complete unbeaten season". Los Angeles Times. ↑ "College Football's Perfect Day". Bleacher Report. ↑ John Walters, Does it get any better than this?, SI.com, October 13, 2005, Accessed March 24, 2009. ↑ Dave Revsine, Michigan, Ohio State set bar high for other rivalries, ESPN.com, November 24, 2006, Accessed March 24, 2009. ↑ The Greatest Intersectional Rivalry: Top 10 Moments from Notre Dame-USC, SI.com, October 12, 2005, Accessed March 24, 2009. ↑ Adam Rose, The Color of Misery, LATimes.com, October 20, 2007, Accessed March 24, 2009. ↑ This Week in Pac-10 Football, Pacific-10 Conference, November 20, 2006, Accessed March 24, 2009. 1 2 Beano Cook, Longstanding West Coast rivalry, ESPN Classic, September 26, 2001, Accessed September 9, 2006. ↑ Mike Rose (November 16, 2009). "Jim Harbaugh and Pete Carroll: What's the deal?". Newsday. ↑ "Jim Harbaugh Incites Rivalry, Pete Carroll Finds New Enemy". Los Angeles Times. November 17, 2009. ↑ Ann Killion (October 10, 2010). "Harbaugh, Stanford still contributing to USC's dynastic demise". Sports Illustrated. ↑ "Stanford upsets USC – again – and keeps Matt Barkley's 'unfinished business' unfinished". Yahoo! Sports. September 16, 2012. Retrieved March 9, 2013. ↑ "Southern California vs. California". College Football Data Warehouse. Retrieved March 9, 2013. ↑ "Southern California Opponents". College Football Data Warehouse. Retrieved March 9, 2013. ↑ Chris Harry, Rivers lives up to No. 55, Orlando Sentinel, February 25, 2008. ↑ Wolf, Scott (November 8, 2002). "IT TAKES A SPECIAL USC LINEBACKER TO BE A MEMBER OF ... CLUB 55". Daily News (Los Angeles). Retrieved November 11, 2009. ↑ Aragon, Andrew (April 21, 2008). "NFL draft preview: USC has top linebacker". Deseret News. Retrieved November 11, 2009. ↑ Moore, Jordan (December 30, 2013). "Sark Makes It Official". ↑ "USC Football History" (PDF). ↑ "Los Angeles Memorial Coliseum". Official Athletic Site - Traditions. University of Southern California. ↑ USC Now Will Recognize Its 1939 Football Team As A National Champion. Trojan have 11 national champs in the sport. USC Trojans Athletic Department, July 24, 2004. ↑ "USC All-time team". AthlonSports.com. Archived from the original on December 1, 2008. ↑ Pedro Moura, Trojans take lead in all-time draft picks, April 30, 2011, accessed May 1, 2011. ↑ "1st Round By Team". NFL Draft History. National Football League. ↑ "USC Trojans Football Schedules and Future Schedules". fbschedules.com. Retrieved November 21, 2013. 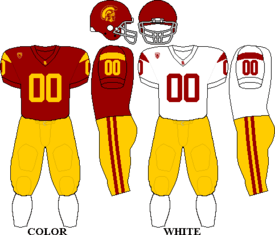 Wikimedia Commons has media related to USC Trojans football.